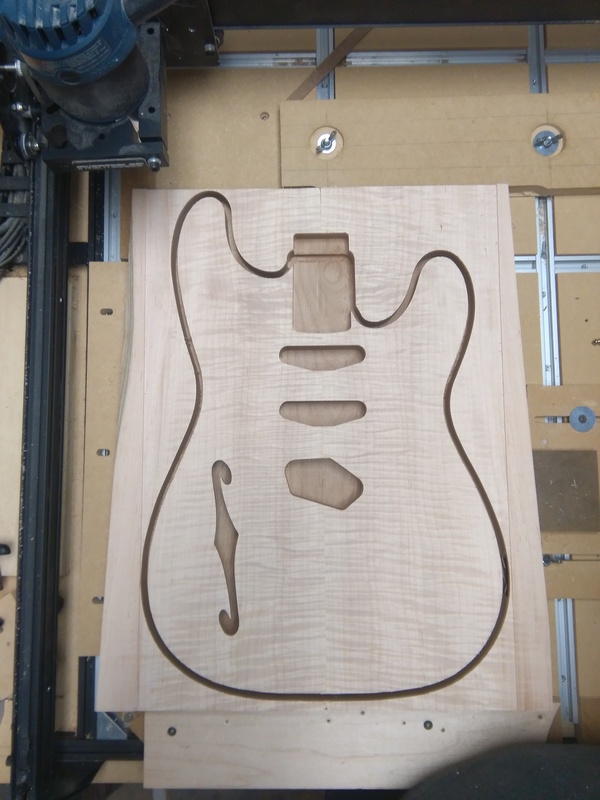 The (un)Official guitar file and Easel project share thread! 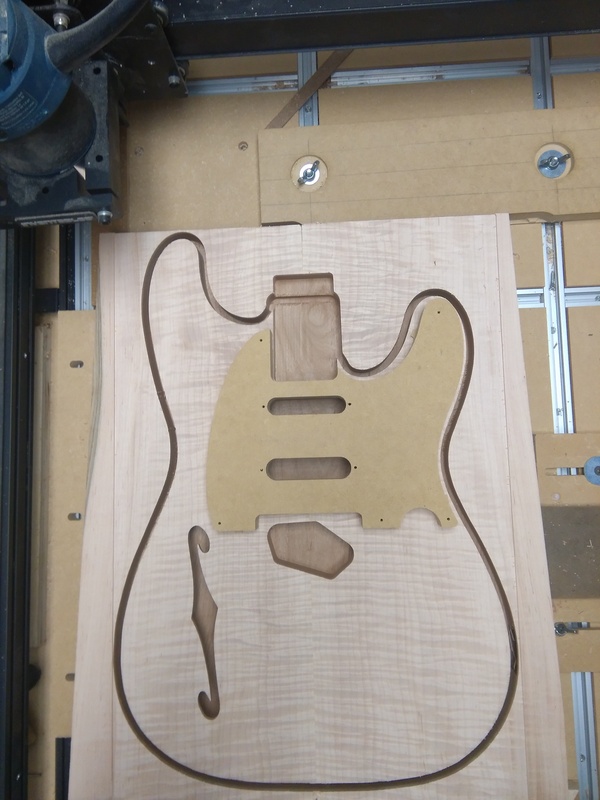 does anyone have a 3d file for a fender strat with the correct neck pocket and cutouts for the electronics I have a guy wanting a strat body but I don’t know anything about the correct dimensions , I have a basic shape file but I want some thing with the rounded edges and the " back and forearm" cutouts already figured in for a 2 sided 3d carving if this makes sense I don’t want to have to use a router or sander to finish the profile only because I don’t own a router table or belt sander. Aspire and for the price of Aspire, you can load up your shop with the tools you need and then some. I forgot to mention that he sells the custom files, you would just have to set up your own tool paths, easy peasy! I forgot to mention that with the files I posted that the neck should be a press fit. However when using them I like to run a couple of strips of masking tape in the pocket area of the neck to add a little bit more wood for sanding to get a perfect fit. Latest Easel creation… When is a Strat not a Strat? That is really nice Chris! @RobertCanning I believe this would classify as a “Stratele”. 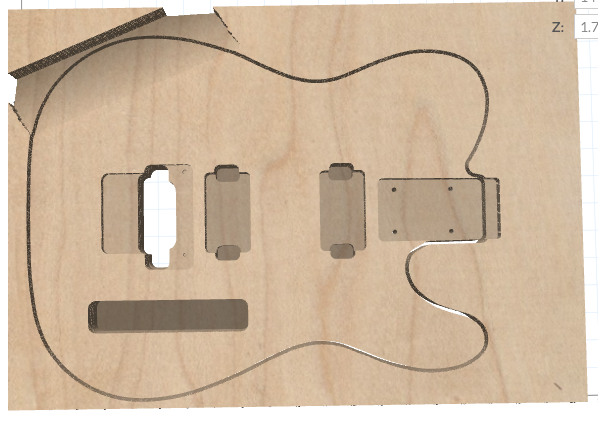 Was going to do a standard tele control route and a pickguard, but decided against it. Just have to figure out how to flip it over now for a custom rear route. I still haven’t even worked out how to accurately step the arm contour in Easel like you have! Any chance you’d share the file here? nice! glad to see someone using my goodies!! I see you have your machine 0’d pretty nicely where your center line is on point. how did you get that down on the money? that’s my biggest concern right now for my machine is not having a proper center line on my builds. also, i’m assuming that the neck pockets on these strat plans are routed for the strat neck plan as well? 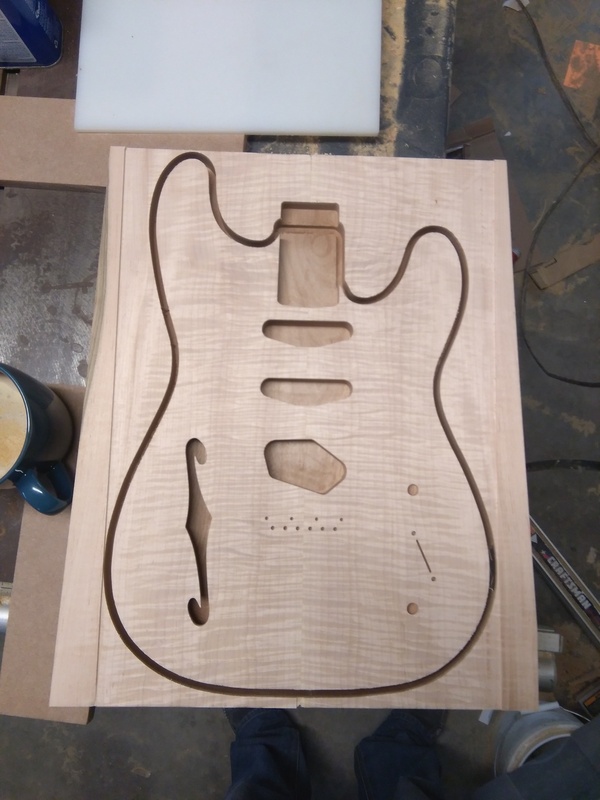 I went to school almost a decade ago to build guitars and really wanted to get back into it and am itching really bad for a new build. I have wood that has been sitting there for YEARS just waiting to be used. any help/tips/advice will be received with great appreciation! Thanks! for centering… i placed the blank on the machine, before i glued the maple top on, and engraved a small section of center line at the top and bottom edges. If you notice the tiny notch cut out at the bottom of the maple, it is to allow me to see the line.Then I used that center line as a reference for gluing up the top. not as hard on my body, as it is a one-piece blank. On the one i’m about to cut, i measured to the glue seam in the two-piece blank with a metric ruler, then centered the design off that x-axis point. Thanks Rodney! I’m going to have so much fun with this!